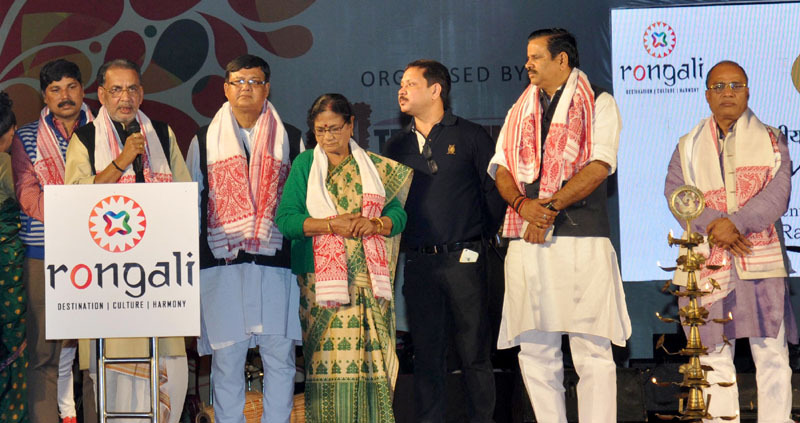 Union Agriculture and Farmers Welfare Minister, Shri Radha Mohan Singh today on the occasion of “Rongoli Mahotsava” at Guwahati, Assam said that “the climatic conditions of the state coupled with rich water resources are highly conducive for the growth of horticulture in the State”. In this festival, an “Exhibition on Agriculture and Horticulture” is also being organized to promote agriculture and Horticulture in Noth- East region including Assam. Shri Singh further added that he wants to fulfill the dreams of the farmers by linking them with the schemes being operated by the Ministry of Agriculture and Farmers Welfare and to increase income of the farmers along with improvement in the quality of the produce by promoting Mega Seed Village Programme. “It is a matter of great honour and privilege that I am present with you on the occasion of “Rongoli Mahotsava”. In this festival, an “Exhibition on Agriculture and Horticulture” is also being organized to promote agriculture and Horticulture in Noth- East region including Assam. This exhibition will provide a common platform to various stake holders and entrepreneurs associated with economic development of North Eastern States, Food Processing, Marketing, Govt. Institutions and Agencies. 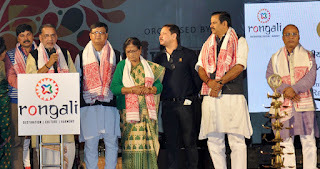 I express my sincere gratitude to organizers of “Rongoli” for inviting me on this occasion and providing me an opportunity to directly interact with the people of Assam. State of Assam, expanded in an area of 78,440 km, is known of its premium tea, silk, one horned rhino and various species of Asian Birds. Kaziranga and Manas National parks of the State have been given recognition of world class wild life tourism spot. Bramhaputra River, older than the Himalaya , is lifeline of the State. State is a big reservoir of Oil, natural Gas and Tea and Tourism industry is playing significant role in the economy of the State. Use of many languages in the state is a glaring example of unity among diversity. Bhupen Hazarika, the great exponent of Assamia Music, has extended Indian Music at International forum. Indian Classical Music is incomplete without Assamia folk music and dance. Guwahati is the Gateway of Eastern India. Assam state is blessed with world fame “Bramhaputra” river and Mother Kamakhya. The climatic conditions of the state coupled with rich water resources are highly conducive for the growth of horticulture in the State. The state receive average rainfall of 2200 Ml. Farmers of the Assam state have keen interest in growing Cash Crops. Considering the problem of floods in several areas of the State, Present Govt intends to motivate the farmers to adopt Horticulture farming over traditional farming. We wants to fulfill the dreams of the farmers by linking them with the schemes being operated by the Ministry of Agriculture and Farmers Welfare. We also want to increase income of the farmers along with improvement in the quality of the produce by promoting Mega Seed Village Programme. National Horticulture Board is playing key role in development of Commercial Horticulture. Recently , we have reduced the area ceiling for open field cultivation from 5 acre to 2.5 acre and for Poly House/ Net House from 2500 Sq Meter to 1000 Sq Meter exclusively for North Eastern States under the schemes of the Board. The very purpose of these changes is to ensure that hard working farmers of NE Region including Assam State take maximum benefit of the schemes of Govt of India and contribute in the growth of the State. Attempt have been made by National Horticulture Board to bring you the famous horticulture produce of various states through “Rongoli”. From time to time Board is also promoting Horticulture produce of NE Regions and also create awareness among the farmers about new technologies in various parts of the country through its Horti Fair known as “Hortisangam”. Recent visit of our Honorable Prime Minister to NE State has generated lot of hopes amongst the residents of this region. Agriculture and Farmers Welfare Ministry is working with full commitment to fulfill your hopes. Scheme to promote Organic Farming has been launched all over the country but Modi Govt has made available special funds for North East. Approval has been accorded for opening another IARI Institute in Kamrup district of Assam on the line of IARI situated at PUSA, Delhi. From past several months, we have been making efforts for transfer of land from the State Govt. A Regional Office of the Krishi Vigyan Kendra for the NE Regions will also be established in Guwahati during this month. We have also requested State Govt to provide land for setting up a KVK at Dima Hasayo District of Assam. Our Agriculture and Farmers Welfare Ministry is working with the sole objective to make farmers prosperous by linking them with various schemes and programmes for Agriculture and Horticulture Development. I appeal to all Farmers to avail various schemes of the Govt of India and contribute significantly in the development of the State and the country. Once again, I express my sincere thanks to organizer of Rongoli and people of Assam.